Emaar brings to you Gurgaon Greens, located in Sector-102, Gurgaon. The project covers an opulent landscape with the choices of 3 BHK and 4 BHK flats and penthouse with separate servant room are midrise developments that are full of scintillating luxury. Emaar Gurgaon Greens offers world-class modern amenities to please any buyer. It is the world full of comfort and affordable luxury crafted for your happiness. This premium project offers you all the privileges that are stuffed with world class amenities to give you a happy living experience. For details of the project visit 99 acres.com today! What is the location of Emaar Gurgaon Greens?The location of the project is Sector-102, Gurgaon. What are sizes of apartments in Emaar Gurgaon Greens? The apartment sizes in the project range from 1650.0 sqft to 3200.0 sqft. What is size of 3 bhk in Emaar Gurgaon Greens? 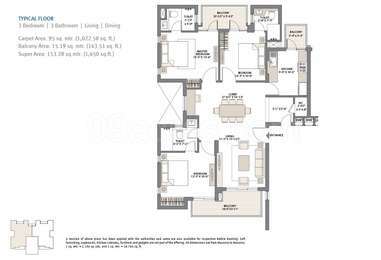 The area of 3 BHK apartments is 1650.0 sqft. What is the 4 bedroom size in Emaar Gurgaon Greens? Four-room units (4BHK) in the project are available in an area of 3200.0 sqft. What is the area of Emaar Gurgaon Greens?The total area that the project occupies is 13.53 Acres. What is total price of 3 bhk in Emaar Gurgaon Greens? 3 BHK units in the project are priced at Rs. 8580000 to Rs. 9240000.
ross Delhi NCR and other key cities like Hyderabad, Mohali and Chennai. The developer is a force to reckon with as it possesses the excellence of two major industry players. The long list of awards and recognitions earned by it include LEED India for Core Shell Pre-certified Gold Award 2011 for The Digital Greens in Gurgaon and National Safety Council of India Safety Awards 2010. It is certified ISO 10002:2004 and ISO 9001:2008. I am planning to buy a 4 BHK in Emaar Gurgaon Greens and the Privilege. Since I will be moving in with my family, I am concerned about the safety of my family. Could someone help with what all steps has the builder taken to ensure the safety of the residents? Hi Arshia! Emaar Gurgaon Greens and the Privilege is a gated society and the builder claims to provide 3-layer security, which means there will be security guards at the main gate of the society to keep a check on each visitor entering the society, then there will be guards stationed at the entrance lobby of each tower. CCTV cameras will be installed at various places in the premises to keep a check on every activity-taking place in the society. Fire-fighting systems are also installed to deal with any unforeseen fire situation. What all facilities are there in and around Emaar Gurgaon Greens and the Privilege for senior citizens? What are the maintenance charges? Hi Savita! Emaar Gurgaon Greens and the Privilege has landscaped lawns for senior citizens to enjoy evening walks. Other than that, there are no such amenities specific to senior citizens. But there are temples like Shri Raghu Nath Mandir, Shri Khatu Shyam Mandir in the radius of 1 km from the society. Also, Esic hospital and Aryan hospital are 5-7 km away. Sector 9 and sector 10 Huda market are just 10-12 minutes from the society, which have pharmacy and other basic amenities shops. The maintenance is anticipated to be charged somewhere between Rs 2.5 to Rs 3 per sqft. Exact charges will be known once there is occupancy.